What is combined footing? Sketch plan and elevation of any two types of combined footing. Question: What is combined footing? Sketch plan and elevation of any two types of combined footing. Combined footing:- combine footing supports two or more column loads. These may be continuous, with rectangular or trapezoidal in plan. It is provided when the footing overlaps and when the exterior column is close to the property line with the result symmetrical isolated footing cannot be provided. 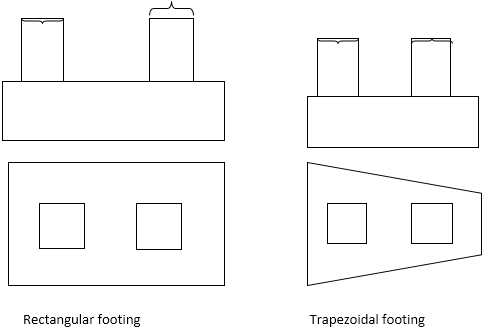 Trapezoidal footing. Trapezoidal footing is necessary if the footing cannot project the required distance beyond the column face or if the external column near the property line is heavily loaded.